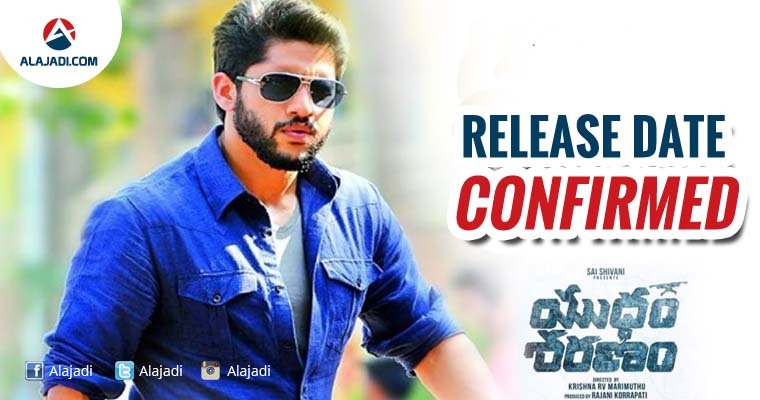 » Chaitanya starrer Yuddham Sharanam gets a release date ! Naga Chaitanya has been making his impact in Tollywood, his Much Awaited Movie Yuddham Sharanam gets a release date. The film which was expected to hit screens on August 11 was earlier postponed to avoid tough competition in the box office. As per latest updates, the film is all set to hit screens on September 8. Krishna RV Marimuthu is making his directorial debut with this crime thriller which has been laced with loads of family emotions. This film marks 14th Film of Chaitu. The recently released teaser has been a massive hit and Lavanya Tripathi is the female lead. Rao Ramesh is playing a crucial role in the film. As per reports Srikanth is the antagonist in the movie. As per insider reports, the movie is certainly going to be an interesting one with huge content. It is tipped to be an intense drama with a lot of thrilling elements. The film is produced by Sai Korrapati and Vivek Sagar of ‘Pelli Choppulu’ fame is composing music for the film. The audio album of Yuddham Saranam will be out on August 25th on the eve of Vinayak Chavithi. The movie’s VFX work is currently in process and it will be wrapped up by the last week of August. Nagarjuna is personally monitoring the post-production work and the movie is heading for September 8th release. Chaitu’s recent outings Premam and Rarandoi Veduka Chuddam minted massive money and the actor is now completely focussed on his next movie Yuddham Saranam. The film is going to be a game changer for Chay as he did not do a film in this genre.